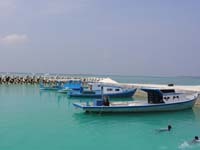 Every year in January - February, around 50 yachts stop at Uligan in the far north of the Maldives on their way from South East Asia to the Red Sea. 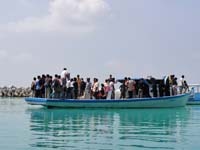 Uligan, an island of less than 500 people, is a port of entry of the Maldives. 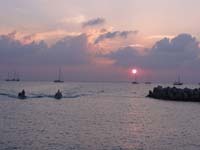 However, very few yachts stop anywhere else in this country of more than 1,000 islands. It has become just a convenient stepping stone for journeys elsewhere although it would really deserve to be a cruising destination itself. The reasons for this are the very complicated bureaucracy and high prices for cruising permits. The people of Uligan are the most friendly and helpful we have ever encountered anywhere. 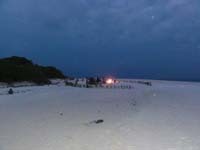 They go out of their ways to make sure that your stay at their remote island should be a happy time. They try to bend the strict rules as much as they can, but the fact remains that officially you cannot stay longer than 72 hours. In the year 2011, when the piracy situation in the Red Sea reached new proportions, there were at one time around 35 yachts anchored outside the village, most of whom stayed for around a forthnight. Although provisioning in Uligan is very limited, the villagers are prepaired to fuel up all the yachts - it is probably one of their main sources of income during the year. 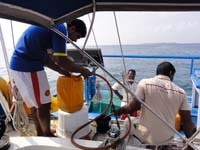 All fuel is brought aboard in 20-30 litre jugs and siphoned into the tanks of the boats. 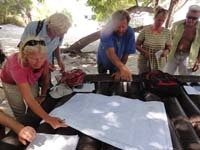 We had 450 litres delivered aboard Scorpio, and the villagers did all the work. The marine life was abundant in the anchorage. We swam with giant Mantas, saw lots of fish and someone even caught a lobster. 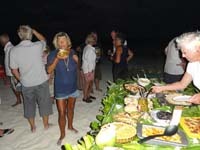 The islanders arranged several pot luck events on the beach and dinner parties serving traditional local food. We had a good time indeed. Although our visit to Uligan was very pleasant, people were quite concerned because of the new and severe situation regarding the recent increase in the number of piracy attacks and their spread on a larger area than before. Please read more about this subject in a separate story: Dilemma in the Arabian Sea. Half a dozen yachts decided to abort the plan to sail across the Arabian Sea and arranged to ship their vessels aboard a cargo ship instead. 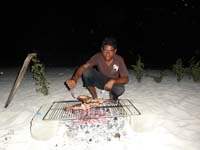 We aboard Scorpio decided to grab the opportunity to cruise around the Maldives for a month or two before returning to Thailand. 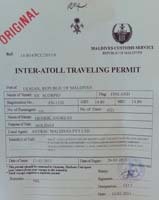 We bought a cruising permit, which was the most expensive document we have obtained during 20 years of cruising. 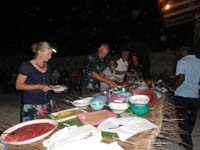 The final cost will be around 1,000 USD, the exact final amount depends of the duration of our stay. 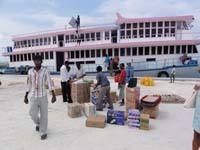 We will now be cruising south to the Capital Male to apply for an extension of our visa and for the cruising permit. View the photos of this report as a (manual) slide show HERE. 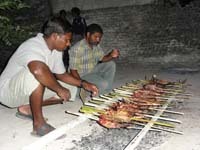 Related report from 2012: Return to the Maldives.